Debt is the capital a businessman borrows from an outside source and agrees to return within a particular period along with the specific proportion of interest. The debt has a very negative impact on the business, but as a matter of fact, most startup businesses have to borrow finances in order to begin operation. Even well-established business setups have taken debts. The most common source of debt is banks, other companies, friends, and family. The term “Leverage” is also used for debt. Companies need to lend money while making huge purchases like equipment and heavy machinery etc. Debt is the real killer for a company. It is a tiger that will eat your company one day if you are not getting rid of debts. The reputation of your company is ruined, suppliers don’t supply you on credit, you may not be able to offer salary increments, bonuses and insurance and can have an overall drastic effect on the business finances. Identify the areas where you are spending unnecessarily and from where you are digging your company into debts. Know the cost of raw material, labor, rent etc and how even a single penny can be saved. Cut down expenses by collecting credit from customers as soon as possible, by renting an office at minimum cost, by using simple office furniture and phones etc. The company’s equipment not in use should be sold out. Similarly, scrap should also be sold out instead of dumping. Analyze whether hiring one individual on more salary is beneficial than giving benefits to two employees. Increase in debts means that a company’s budget is ineffective. Reassess your budget and make adjustments accordingly. Revenue should be more than fixed costs, i.e. utility bills and rent, etc. in the budget. After allocating money to variable costs like manufacturing, etc., allocate a fixed portion of the budget to pay debts so that piling up of loans can be avoided. Have a detailed discussion on monthly transactions. Bookkeeping will help you to review loss, profit, purchases, and sales. Inventory is one of the major elements where a company is spending too much. A few tips for inventory should be adopted. Only purchase items which are necessary. Heavy equipment which can be borrowed on rent should never be purchased. Dead or excess inventory should be avoided. Dead items should be sold out or returned back to the supplier, if possible. Interest fees on credit cards are a major expense for companies. You should talk to your credit card issuing authority about low-interest rates. If you are an old customer and pay on time, then a credit card issuer may agree upon fewer rates. Efforts should be made to increase the revenue of the company. Revenue can be increased by using strategies to enhance productivity. These strategies may include capacity building and skill development of staff by training and knowledge, the introduction of new technologies, new marketing strategies to enhance sales, etc. Profits will be improved which may be used to pay off debts. This is one of the quickest ways to minimize interest rates. Instead of paying various loans with different interest rates, consolidate them into one single loan with less interest. This will reduce the monthly expenses on loans without affecting credits. The investor is not a good option normally because you have to sacrifice a portion of your future profits. But if you are sinking into debts, then look for an investor to support your business financially. It is not possible to get out of debt without adopting the above mentioned strategies. 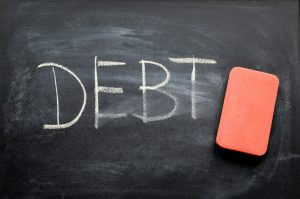 Debt is a threat to your company and your company needs to work on getting rid of debts as soon as possible.